This is a great recipe to practice some basic baking skills such as rubbing fat into flour and kneading and shaping dough. And after the practice the reward is a deliciously orangey shortbread! Follow a recipe; follow food safety & hygiene rules; tidy away; use a sieve; rub fat into flour; knead; shape dough; use balance/digital scales; use a citrus squeezer/zester. Citrus zester, sieve, mixing bowl, baking tray, fork, oven gloves, cooling rack. Lightly grate some zest from the orange. Sieve the flour into a mixing bowl and add the cinnamon, sugar and orange zest. Rub in the butter or margarine. Bring the dough together and knead it lightly. Place the dough on the baking tray and press or roll the dough into a round disc 1cm thick. Prick with a fork and decorate the edge. Using oven gloves, place the tray in the oven for 15-20 minutes until firm. Cut the shortbread into eight segments and place on a cooling rack straight away to cool. 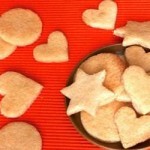 Shortbread is a type of sweet dough, high in both fat and sugar. The Eatwell guide shows us that these foods are not needed in the diet and so, if included, they should only be eaten infrequently and in small amounts.